Vernon A. Dickeson, 93, of Topeka, passed away on March 17, 2019. He was born on August 4, 1925 in Waterville, KS the son of Clarence Dickeson and Stella (Fulker) Dickeson. He graduated from Hiawatha High School and went on to enlist in the United States Army and served during World War II. He worked as a foreman for the City of Topeka Water Treatment Plant, retiring after 36 years. He was a member at Grace United Methodist Church, where he served as a trustee and usher. He was also a member of the Crusader’s Sunday School Class, which he served as president. 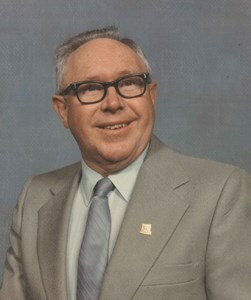 He was also a member of Topeka City Retirees, serving as president from 1993-1994. He was known for his fun and crazy sense of humor, making peanut brittle at Christmas time and his love for the Royals and KSTATE. He enjoyed spending time with family and traveling with tour groups throughout the United States. He married Hazel (Maley) Dickeson on May 18, 1948. She preceded him in death on April 26, 1985. He was also preceded in death by siblings, Blanche Dickeson, Reuel (Carole) Dickeson, and Lloyd (Wilma) Dickeson; in-laws Marjorie Dickeson and Everett Haselwood. He is survived by children, Terri Hewitt, Gayle (Joseph Jr.) Brunner, and Cherl Dickeson; grandchildren, Bradley (Leila) Hewitt Sr., Cindi (Ted) Valdivia, Hayley Dutcher, Joseph (Shauna) Brunner III; great-grandchildren, Alyssa Hewitt, Bradley Hewitt, Jr., Cassandra Hewitt, Austin Hewitt, Alayna Hewitt, Maura Valdivia, Blake Brunner, Natalie Dutcher, Alexandria Brunner and Joseph “Will” Brunner; and great-great grandchildren Addelynn and Brynn;siblings, Leonard Dickeson and Eula Haselwood and many nieces and nephews. The family will receive friends during a visitation from 6:00 p.m. to 8:00 p.m. on Wednesday, March 20, 2019 at Mount Hope Cemetery & Funeral Chapel, 4700 SW 17th Street. A funeral service will be held at 11:00 a.m. on Thursday, March 21, 2019 at Mount Hope Chapel. Burial will immediately follow the chapel services. The family will host a reception following the graveside service in the foyer at Mount Hope Cemetery Chapel. Memorial contributions may be made to Fisher House™ Foundation, Inc., 12300 Twinbrook Parkway #410 Rockville, MD 20852, (888) 294-8560. Penwell-Gabel Mid-Town Chapel is handling arrangements. To leave a message for the family online please click the "Share Memories" button above. Add your memories to the guest book of Vernon Dickeson. Teri Cherl and Gayle and families; It’s sad to lose our loved one, even harder when it’s a parent. I’ll always remember your dad’s laugh. His smile was infectious and his sense of humor unbeatable! You all meant the world my dad. He told stories of you girls as children and my memories of you all playing with us as kids are all like yesterday. I love you all.